Made by Baunscheidt, Carl in Bonn, Germany, 1865-1875. The Lebenswecker is a tool used to pierce the skin, and in conjunction with a stimulating oil, cause blisters and irritation. One purpose of this instrument was to raise blisters to relieve an illness or infection by setting up a secondary inflammation on another part of the body. The theory is that by setting up a secondary infection or inflammation, the body’s attention would be diverted away from a bigger infection or illness and the patient would heal faster. An instrument used in homeopathic medicine called a lebenswecker (directly translated as life awakener). The lebenswecker consists of a turned, cylindrical length of wood with a moveable shaft protruding from a fixed stem. There is a lid on the bulbous head of the instrument that unscrews to reveal thirty small steel needles fixed to a metal plate. 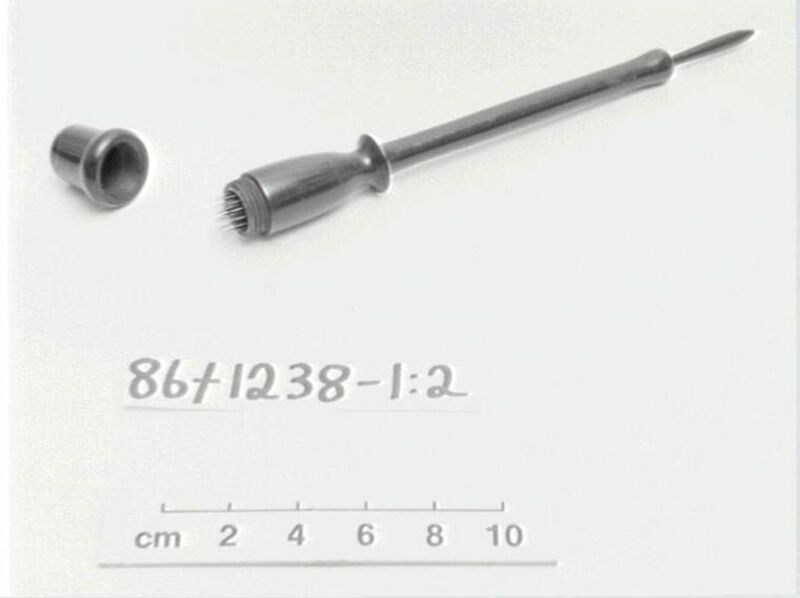 The instrument was used by holding the head against the patient's body, drawing back the spring-loaded shaft, and letting it go quickly to cause the top layers of skin to be punctured by the steel needles. A drop of Baunscheidt's oil would then be applied to encourage the formation of blisters. The lebenswecker was made by Carl Baunscheidt in Bonn, Germany, between 1865 and 1875. Carl Baunscheidt studied chemistry, physics, mechanics, and horticulture in the early 1800s. Although he never gained a formal medical education he developed a general understanding of contemporary medicine and he produced the first Lebenswecker in 1848. He went on to invent a range of pharmaceutical products including a smallpox vaccinator, a mouth wash, and an oil that was alleged to "clense the blood". The Lebenswecker was used with an accompanying oil, the ingredients kept secret, and used together, Bauncheidt claimed they could cure all types of illnesses and suggested it did this through "creating additional pores" in the skin which allowed toxic substances to be more rapidly exuded. The instrument became extremely popular. Baunscheidt's company produced them until it was bombed by Allied attack in 1944. This Lebenswecker was purchased by the Museum in 1986.